My wife and I are new Parrot owners. We both have a love for birds, but hated the thought of getting a bird and limiting it's flight (if I could fly, I wouldn't want to stop!). However, we have a friend who had 2, both rescues, 1 a foster, and we would look after her pets when she was away. After some time interacting, we decided to adopt the foster Parrot. Captain Jack (is it bad to change this name?) is 8 years old and we don't think he ever flew. Information we got suggests he was in too small a cage to spread his wings. We're a few days in, and he already loves to step up, loves me to pet him, and tries to get a little playful (which can be scary). The only real "problem" I have is getting him to step off me. If I try to make him step up onto something, he grabs my shirt in his beak and claws at my arm. It's worth noting my wife works from home, but when I get home, he wants not seems to want me. I had that problem and set up a play area at shoulder level. I would entice her to go to her fresh fruit tray. Welcome to the forum, Brit, wife and Captain Jack! Yes, it is bad to change the name because parrots not only understand the concept of a proper name but use them themselves, same as people do] BUT there are actually many, many birds whose owners never actually taught it its name and does not recognize the word as such in which case you should pay a lot of attention to see what word or sound he uses as his name. My newest bird is a female quaker which name was supposed to be Gryphon but she did not answer to it once so I watched her very closely and paid attention and identified a sound she uses all the time and to which she replies: Keku, so that became her name. 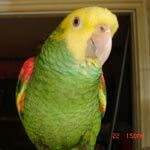 Same thing with the bird before that one, a caique whose name was supposed to be "Cheeks' but who answers to Javi [his previous owner's name]. Now, just because a bird does not take off, it doesn't mean that you can assume that he will never fly so, please, be careful of not taking him outside without a harness and, also, please do your outmost best for him to fly by exercising him and prompting him to it [it's unhealthy for birds not to fly, their respiratory system atrophies]. Be careful of your interactions with him [was he DNAd a male? ], this is a big bird with a powerful beak so no roughhousing with him at all and not touching anywhere but his head, neck and cheeks [everywhere else is no-touch zone]. Besides, he is in his honeymoon period so you need to wait until he is over it before you can begin to get a sense of his real personality and you don't want to push it now and suffer the consequences later. b] in the afternoon, they go back because they spend hours and hours and hours out of their cages and are ready for a nap or to munch on some more food. But the best [easiest] time for them to go back is in the evening when you give them their dinner because, if you are keeping them at a strict solar schedule and feeding right [meaning NOT free-feeding protein food], they are super eager for their nut and/or seed dinner.